At an altitude of 5416 metres, the Thorong La is the highest mountain pass that trekkers have to cross on their 300 km journey around Annapurna. The pass connects the Manang district in the east to the Mustang district towards the west. Trekkers usually cross the Thorong La from the Manang end, after stopping for a night’s rest at ThorongPhedi (4,540m) or the Thorong High Camp (4,880m). Attempting to cross from MuktinathPhedi (4,190m) in Mustang is a more arduous task as the elevation gain is increased along with the risk of AMS (Acute Mountain Sickness). This additionally results in a steeper descent to Manang. Starting as early as 04:00 am in the morning to cross the pass is suggested as it gets pretty windy, hurtling dust and pebbles around in the afternoon. Also, since no lodging or settlement is present in this rocky region, the day’s itinerary is rigid, making it the toughest during the trek. Thorong La is covered in snow during winter, blocking the route across the two districts. 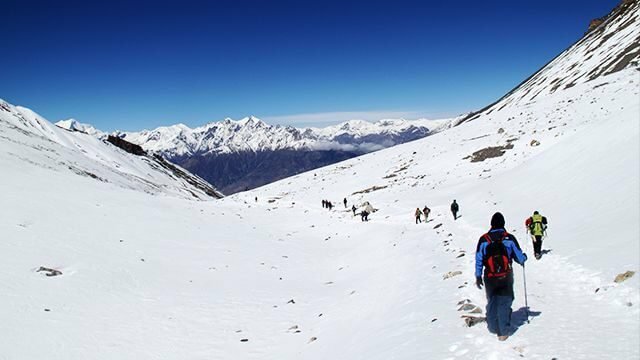 Winter treks, as a consequence, is less in number and attempted only by the most experienced.